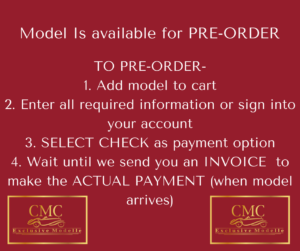 It is a pleasure for CMC to introduce to you the developmental history of the D50 race cars in the form of a bundle. 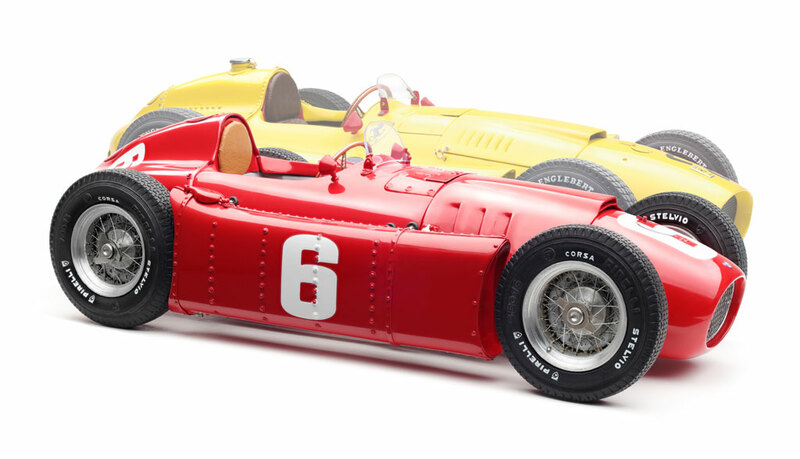 The bundle consists of 2 models: The one with #6 is representative of the Lancia D50 from the year 1955, and the one with #20 represents its modified version known as Ferrari D50 from the year 1956. On March 27, the 1955 GP of Turin (also known as the Gran Premio del Valentino) took place in Turin, the capital of Piedmont, Italy. Contestants of this race were to complete 90 laps of its circuit, quivalent to a total distance of 378.0 km. This race event did not contribute points to the world championship. Congregated on the field were three racing teams — Lancia, Ferrari and Maserati. 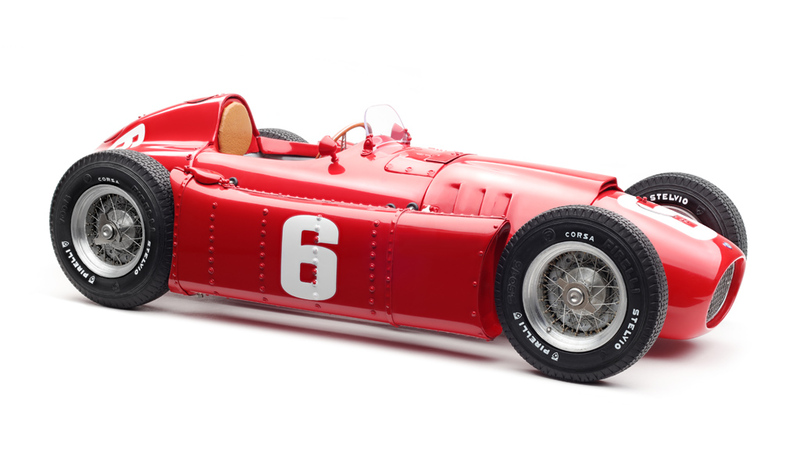 Lancia sent its star dri-ver Alberto Ascari in a Lacia D50 with #6. He had Eugenio Castellotti and Luigi Villoresi at his side, who were his teammates. Maserati dispatched a very strong team that consisted of Jean Behra, Luigi Musso and Cesare Perdisa. Ferrari chose to send those deemed to be “most promising candidates,“ such as Harry Schell, Maurice Trintignant, Guiseppe Farina and Alfonso de Portago. In the qualifying practice, Alberto Ascari secured the pole position for himself with 1: 42,0 min. Jean Behra was only 0.2-second slower, thus taking the second place in the front row. Luigi Musso qualified for the third with 1: 43,1 min. Row two was line up with Farina in a Ferrari, Roberto Mieres in a Maserati 250F, and Villoresi in a Lancia D50. Behind them were Trintignant in a Ferrari and Castellotti in a Lancia D50. After various position battles by the three racing teams, Ascari took the lead on Lap 22 and got to extend his lead. This went so far that he surpassed his teammate Castellotti during the 60th round. After 90 laps, the finish line was crossed in the order of Villoresi, Castellotti and Ascari. But Alberto Ascari was the clear winner, for he had one lap advantage over the others and won the race in 2 hours and 40 minutes. Roberto Mieres finished second for Maserati. Harry Schell was the only one from the Ferrari team who finished the race and took a fifth place. 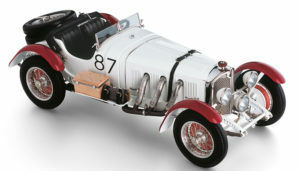 This was the first Grand Prix victory for Lancia. For Alberto Ascari, it generated a very sweet sense of achievement after a long dry spell. The last time he had a GP win was dated back to the Grand Prix of Switzerland in1953. 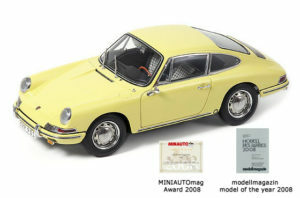 Note: The Ascari Model with # 6 has somewhat different looks from the Monaco Standard Model (M-175). The bonnet is cut with 3 louvres only in each of the two ventilation rows and the external oil coolers are relocated to the stub side of the engine. The Grand Prix of Belgium 1965 took place on June 3 at the Circuit de Spa-Francorchamps in the town of Spa, and it was the fourth race of the 1956 World Cup. Contestants of this race were to complete 36 laps of its circuit, equivalent to a total race distance of 508.32 km. 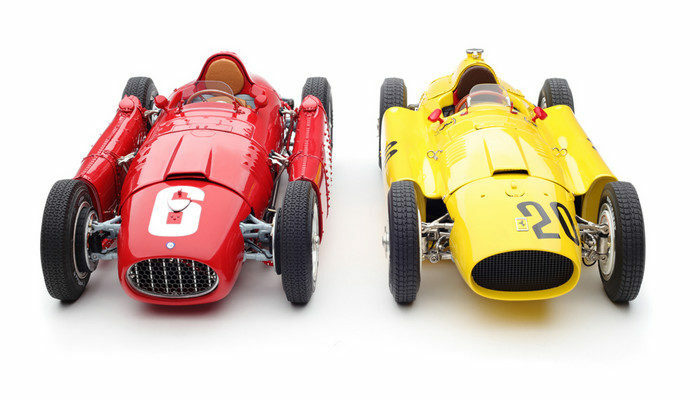 As in the previous races, two Italian racing teams set the tone – Ferrari and Maserati. Both started with five drivers. 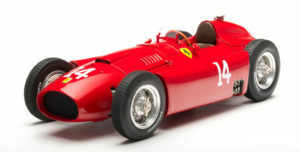 In addition to its three regulars, namely, Fangio, Castellotti and Peter Collins, Ferrari put two more cars to use by the Belgian national heroes Paul Frère and Andrè Pilette. 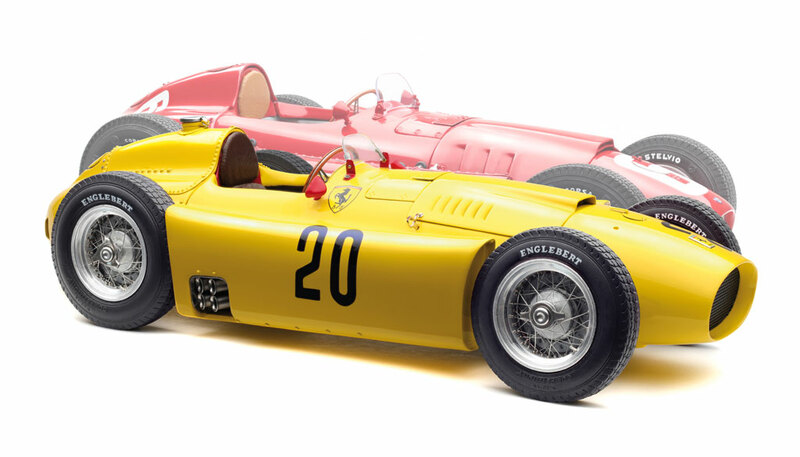 Although as of 1956, André Pilette was yet to be a winning driver, we chose his Ferrari D50 as a component of the bundled set so that we can pair a red-finished CMC Lancia D50 with a yellow-finished CMC Ferrari D50 (yellow being the racing color of the Belgians). Maserati also had its own regulars: Behra, Stirling, Moaa, Cesare Perdisa, Chico Godia. 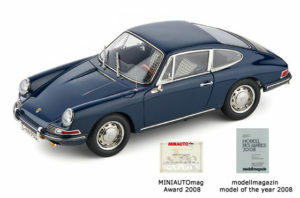 During the quali-fying practice, Juan Manuel Fangio secured his claim to pole position, whereas Moss was able to assert his access to the second place. He was followed by Collins in the third place and Jean Behra in the fourth place. Behind Castellotti in the fifth place were two Vanwall pilots, and then the two Belgian national heroes. The moment the start flag was lowered, Moss took the lead immediately. Lagging behind by a few places at first, Fangio recovered the lost ground and was right behind Moss before long. With Collins and Cas-tellotti sharing the fourth position at this moment, Maserati was virtually leading the three Ferraris. Fangio pushed more and more on the pace, and slowly he was closing in on the leading Moss. He surpassed Moss on lap five and took the lead. By lap ten, Fangio’s lead was increased to a respectable eight seconds. Then a series of happenings began to break the ranks. Castellotti had to retire with a technical defect in his car. Stirling Moss went off the track after a wheel came off. It enabled Collins to advance to the second position so that Ferrari had a double lead now. Moss managed to take over Perdisa’s car and continue with the race, but he was one lap behind leader Fangio. On lap 23, however, Fangio’s car developed a serious engine problem, and the race was over for him. Collins took over the lead, which he did not give up until the end of the race. Behra and Frère dueled for a second-place finish until Behra fell back to the seventh place due to some engine problems. In the end, Peter Collins gave Ferrari its second win of the season. Frère also secured a 2nd-place title to seal a double victory for Ferrari. After Moss resumed racing in his teammate‘s car, he fought courageously and finally finished third. Overcoming a one-lap gap, Harry Schell finished fourth. 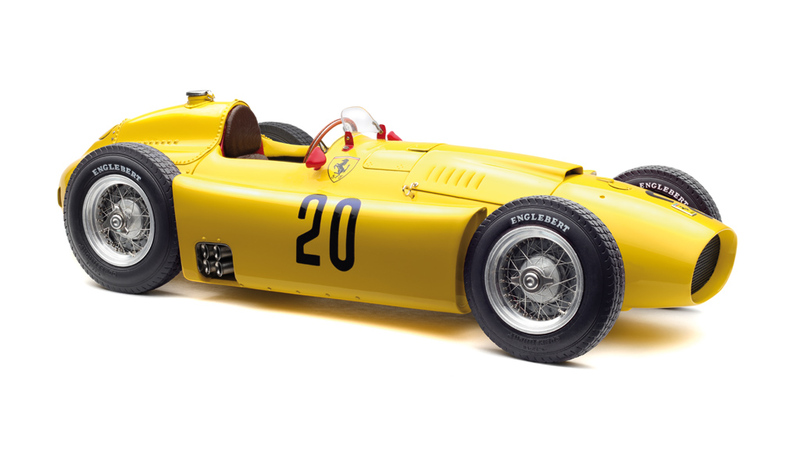 Thanks to a deliberate driving style, Andrè Pilette took a respectable sixth place in his beautifully-finished Ferrari D50 with #20.